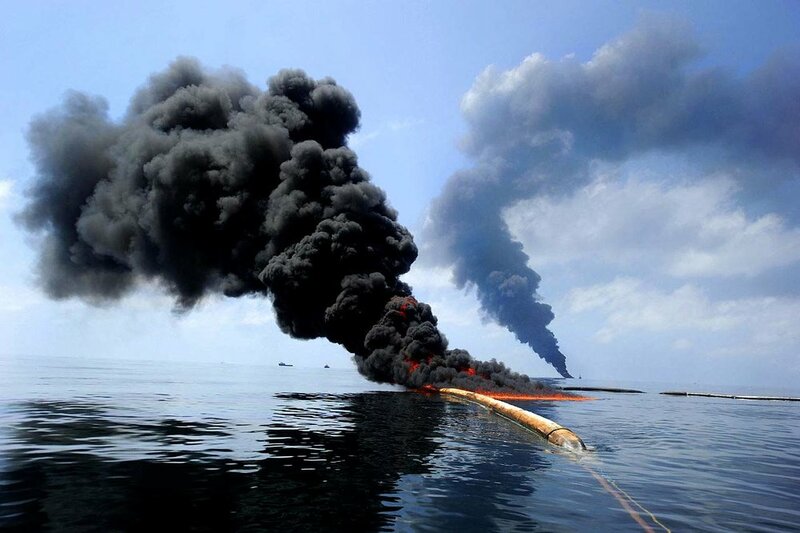 Dark clouds of smoke and fire emerge as oil burns during a controlled fire in the Gulf of Mexico, May 6, 2010. The U.S. Coast Guard, working with BP, local residents and other federal agencies, conducted the burn to help prevent the spread of oil following the explosion on Deepwater Horizon, an offshore drilling unit. What is it with politicians sacrificing their children? Back in the early days of the mad cow disease outbreak in Great Britain, then Environmental Secretary John Gummer caused an uproar when he fed his four-year-old daughter Cordella a hamburger on national television in order to convince people in the UK that cow flesh was safe to consume. Now we have President Obama visiting the Gulf Coast so his nine-year-old daughter Sasha can swim in the gulf waters for a photo op. He and his family also dined on seafood from the Gulf, declaring that "Seafood from the Gulf today is safe to eat." It is extremely telling when someone will put their own family members at risk to salvage an industry’s reputation. It is a calculated risk; the kids probably won’t die soon enough for any fallout that will affect their parent’s careers. To be fair the kids probably won’t die from their one act of absorbing toxins during a lifetime of similar exposures. Still, politicians who are supposed to be role models are instead are performing public acts of child abuse. Who exactly is President Obama serving when he claims the Gulf waters are safe to swim in and eat from? His statements will undoubtedly be spun to favor the small fishermen and their families financially devastated by the toxic contamination of wildlife. We can identify with the hard working people living on the Gulf who have lost so much. For them we will ignore the little nagging voice of alarm in the back of our heads while we eat the sea creatures they capture for us. The industry that Obama is really shilling for is the one that devastated the Gulf in the first place - Big Oil. We are addicted to it. We are all guilty of supporting the corporations that extract it from the Earth. Addiction means not deeply examining the behaviors that are hurting us. It means not making changes to address these behaviors. Built into Capitalism is the need to keep us addicted. Politicians reassure us and to absorb the blame while ad agencies and corporate media amp up our addictions. They lead us to believe everything is going green while the waters that support life are turning black. They make us assume we are craving protein when we are starving for nutrients. Our minds and our hearts crave substance. It is a cozy thought that the oil ‘spill’ is over and the Gulf will be back to normal soon enough. The truth is it will not return to ‘normal’ in our lifetimes. Even before the BP disaster there was and continues to be a dead zone in the Gulf of Mexico at the mouth of the Mississippi River that fluctuates in size from season to season. It has grown up to seven thousand square miles in recent years. It is called a dead zone because the water has become hypoxic, meaning it does not contain enough oxygen to support most life. 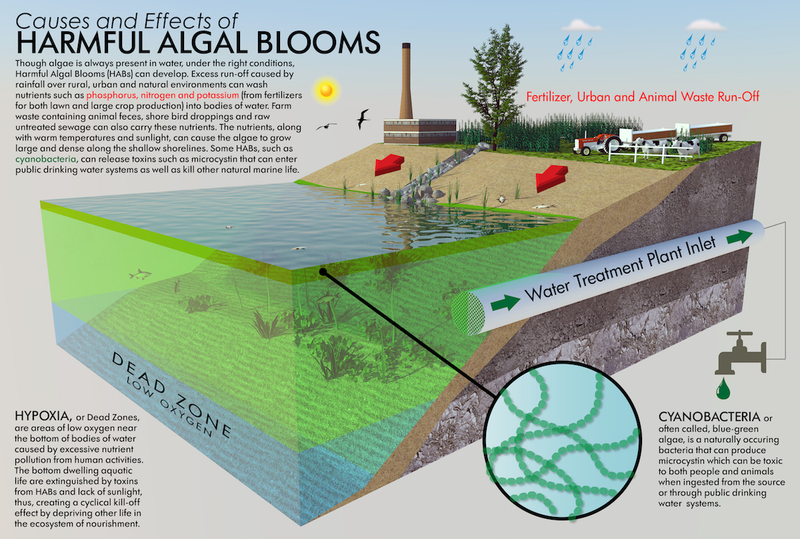 According to the EPA website “Hypoxia can be caused by a variety of factors, including excess nutrients, primarily nitrogen and phosphorus, and waterbody stratification due to saline or temperature gradients. These excess nutrients, eutrophication, promote algal growth. As dead algae decompose, oxygen is consumed in the process, resulting in low levels of oxygen in the water.” How does the Mississippi River get contaminated with excess nitrogen and phosphorous? Runoff from agricultural fertilizers and factory farm waste operations are the biggest culprits. It seems that our addictions to land animal proteins are impacting our access to sea animal proteins. Alas. We are addicted to meat, dairy, fish and eggs the same way we are addicted to oil. We are both consumers and commodities in a complex system that keeps us addicted. Our culture is based on shaky premises and is our enemy inasmuch as it promotes traditions we hold sacred that are killing us. Steak and automobiles, cigarettes and alcohol, cheap fast food and lives of convenience. We choose to ignore that the side effects are Diabetes, cancer, heart disease, dead zones, global warming, and mass extinctions. It is interesting that our consumption patterns consume our bodies and the Earth that sustains us in toxic and harmful ways. The answers to our modern dilemmas are not easy to come by. It is nearly impossible to survive now without relying on corporations to feed us, transport us, employ us, etc; We have become powerless in many ways and if parts of the system begin to collapse our ability to survive will be severely tested. Katrina and the BP disaster are not isolated incidents, they are wake up calls. In the near future there will undoubtedly be disasters that will really shake up civilization as we know it. As New Orleanians we have had two within the last decade that should already have given us a taste. One caused by nature, one caused by human folly. We have become the unwitting testing ground for system failure. The question is will we be examples of how to transform these tragedies, or will we just go back to our addictions? The future is in our hands.